Standing out at your event is a must for any company! Let us help you to create that one-of-a-kind brand for which you are looking. Here is a small selection of options for your next event. These name tags are a perfect solution for any event! 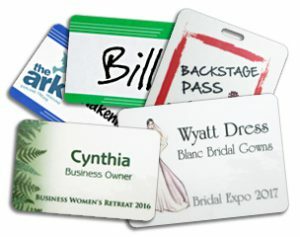 Networking is easy when everyone has a professional name tag, and the low cost won’t destroy your event budget. 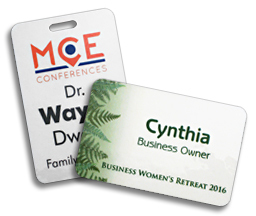 Instead of spending your time printing inserts and stuffing vinyl name badge holders, let us print your attendees’ names on custom laminated badges. 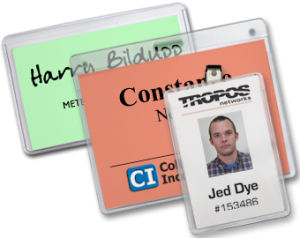 Lanyards are popular for their ability to keep essential items like a name badge or pen close at hand. 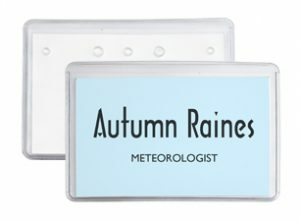 Most often they have a name badge holder attached, and sometimes the badge holder displays the entire agenda for a meeting or conference. 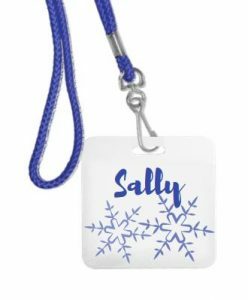 Lanyards are available in a wide variety of styles, sizes, materials and colors. Customize them with your logo, text or slogans. Lanyards can serve as an efficient and inexpensive source of advertising when worn or given away at events. 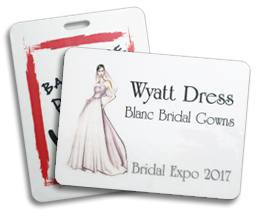 Badge holders are an event staple as they are frequently used for conferences, conventions, trade shows, meetings, schools and visitor passes. 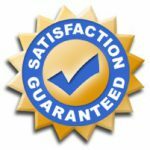 Not only are they a good choice for these events, but they are also a fantastic option for reusable needs. Use these reusable tools for an agenda holder. Print out the schedule of classes or a map of your event for attendees to keep near them for easy access and reference. 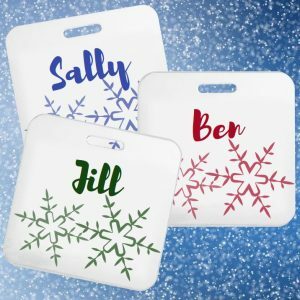 You might also include a dry erase marker for each person as a way of keeping notes that can be easily wiped off when not needed anymore. 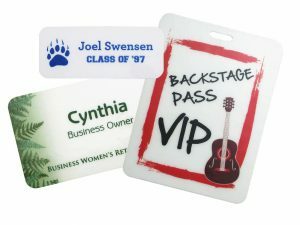 Attach these simple ribbons using the adhesive strip to name badges and name tags to show who is who at a corporate event. Use titles such as president, secretary, staff and so much more. 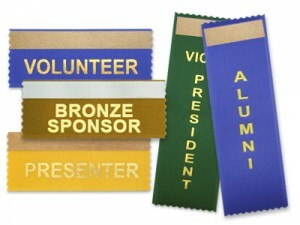 Also use these as achievement ribbons by using titles like sponsor, alumni, delegate or pretty much anything else. Badge ribbons are a great tool to use at events like corporate meetings or conventions.